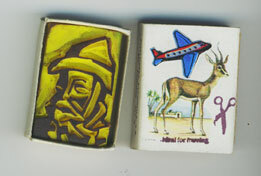 Description: A small matchbox with deer design in which I have placed hand carved rubber stamp of Gutenberg. Sticker and rubber stamp on outside of box. Comments/Origin: I think the matchbox came from a collector's fair devoted to matchboxes which comes to Northwich every year. The stamp was made for a mail art show / project about Gutenberg (the man who nvited the modern printing press). I'm not sure why these things seem to go together but they fit and seem happy. I hope they will fit and be happy in the Museum of Temporary Art!